Raw Model - The Lifestyle for Beauty, Energy, and Mental Clarity: BIG dome update! I left my camera at my parent's place. Its too bad, because I took so many good pictures of the greenhouse. It has really exploded with greenery. I was SOOO relieved. with the motivation...it was night and day compared to February. and really enjoyed being with the the plants. The persimmon trees are starting to blossom!!!! are waiting to be transplanted outside. trees, which are just now beginning to show some little buds. those very cold and dark months. it will reach 120F in the summer easily if they are broken. The camera will be here by the end of the week! with loads of lambsquarters and bee pollen. AMAZING. early June...its mid april and they are already 12 inches tall. Growing right on top of the compost heap! like a sad and very expensive joke. 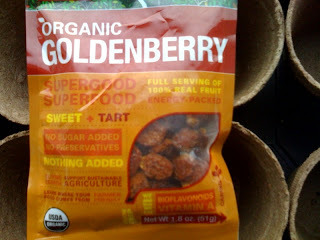 Ok...planting incan berries and schisandra berries today. 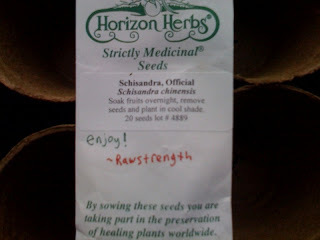 Thanks Rawstrength for sending those S. Berries to me a while back! I will DEFINITELY send you some when they are ready! 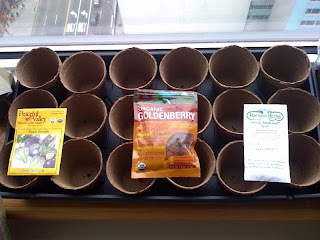 I am starting a new flat of seeds, so I have 18 open slots. Not to mention blue and purple corn chips! Here are the Incan Berries. All delicious and easy to grow. Read a funny article about them HERE. What would you do if you had TOO MANY incan berries??? They like shade, so that is perfect. your home or yard. Cacao trees like Shade...think about it. and likes indirect light. We'll see how it goes. Anyhow...Ill get those dome pics and vids up asap. 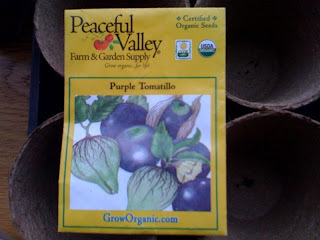 a mile walk from the garden...cant wait to try this stuff..
the garden spirits are NOT happy with you.